Marley Gras Jerk Chicken Festival is back with its original name as well as a full slate of local, national and international acts to accompany the Jamaican cuisine. 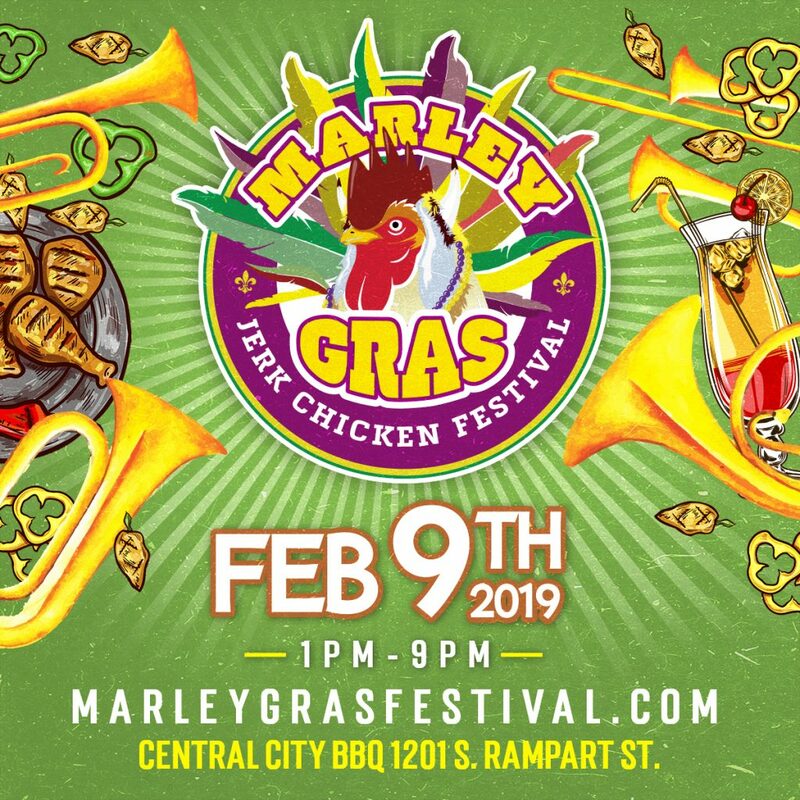 The celebration of the connections between New Orleans and Caribbean culture is set for Feb. 9 at Central City BBQ, 1201 S. Rampart St.
Festival organizers and the Bob Marley family estate have resolved their legal dispute, and the festival can use the name “Marley Gras,” festival organizers announced. The name was changed to NOLA Jerk Chicken Festival in 2017, its inaugural year, in response to complaints from Marley International. But the festival continued to celebrate the reggae pioneer, who was born during Carnival season on Feb. 6. “The Marley Family is not a sponsor of Marley Gras nor is it affiliated with the festival but they have granted us permission to use their name,” a Marley Gras Festival press release states. It will feature 20 musical acts on two stages and 17 food vendors serving up creative renditions of jerk chicken and other Caribbean style dishes, New Orleans’ classics and Caribbean drinks. The festival also hosts New Orleans’ only Scotch Bonnet pepper eating contest and Jerk Chicken Cook-Off with celebrity guest judges. The judges are nationally renowned radio personality Wild Wayne, the 2019 New Orleans Magazine Chef of the Year restaurateur Edgar Caro, multi-platinum award-winning producer BlaqNMild, New Orleans’ No. 1 foodie, Anthony Dazet from @EatingNOLA, celebrity chef Ashley Jonique, social media sensation LaStarya, and mationally touring DJ and official DJ of Curren$y’s Jet Life records, DJ Kelly Green. The acts on the main stage include Robin Barnes performing Bob Marley tunes and reggae singer Rayvon. A full lineup is below. The indoor stage features DJs Raj Smoove, Jubilee and Tashia and two international DJs, DJ Davy and DJ Megatron. Food vendors include Boswell’s Jamaican Grill, Island Paradise Bar & Grill, Johnny’s Jamaican Grill, Karibu Kitchen, Central City BBQ, Queen Trini Lisa, Cool Fruit Sensation, Ms Linda the Yakamein Lady, PhytoNOLA (vegan), 14 Parishes Jamaican Grill, Cue’s Cajun Corner, NOLA Soul Pie, Sweet Grass, Bonnet’s Jamaican Grill, Fluffy Cakes Cupcakery, Keyala’s Pralines and Froot Orleans. Entry is $20 before 3 p.m., cash only. Children’s tickets are $5. Advance tickets are recommended (it can sell out) and can be purchased at www.marleygrasfestival.com/tickets. For more information, updates and offers, visit the Marley Gras Jerk Chicken Festival website, the event page on Facebook or @MarleyGrasFest on Instagram.